1. This model uses a unique lens design that provides excellent sphero-chromatic correction using an extra low dispersion center element and a very expensive Lanthanum rear element. This lens has a unique glass combination that delivers color free, high contrast performance. 2. These are not mass produced optics. The SVX130T objective is hand figured in our optical shop in Auburn California to the highest optical specifications. We address spherical issues, astigmatism, trefoil and coma by individually hand crafting each objective by machine and by hand. We provide a certified American test report with every 130 mm telescope we manufacture demonstrating its optical prowess. This lens, with its optical design and high optical accuracy outperforms less expensive lenses of standard commercial quality. More: Air spaced lenses that are 5" and larger are often mounted in aluminum cells. 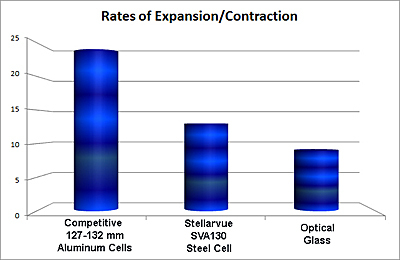 These cells expand and contract many times more than the glass. The larger the lens is, the more important it is to have it mounted in a cell with a similar coefficient of expansion (CTE). LZOS in Russia has always provided their 130 mm and larger lenses in a steel cell for this reason. Other 130's use simple aluminum cells which expand and contract around the glass many times more than our cells, distorting the image. Using a material that closely approximates the expansion and contraction rate of the glass is much more expensive but it maintains the performance of the lens despite dropping temperatures. The SVX130 is a full triplet apo. 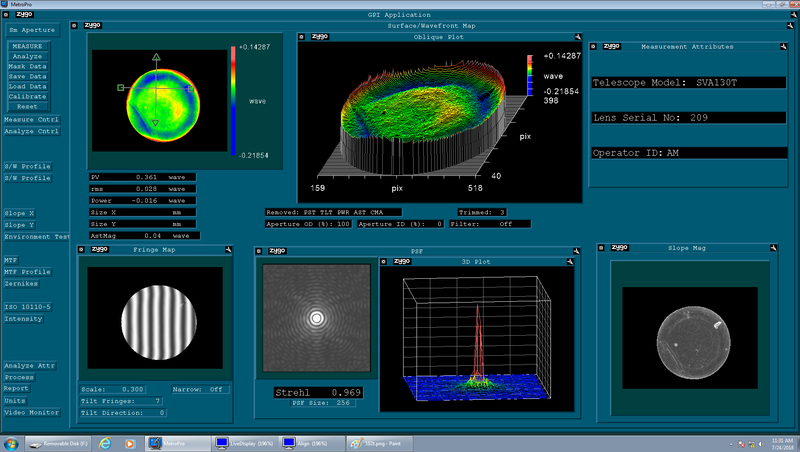 Expect zero false color, high contrast and an exceptional star test. Our new 3.5" dual speed rack and pinion focuser comes with draw tube rotator to provide more accurate rotation when imaging. We enhance the performance of these focusers by using bearings that have no slop when properly adjusted. The 3.5" aperture significantly reduces vignettng seen in 130's with smaller focusers. We use American made CNC mounting rings, a retracting dew shield, metal dust cap and protective case. 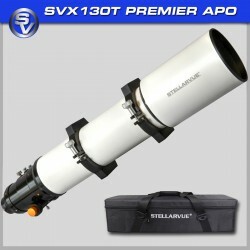 ellarvue C130L comes standard with SVA130T. This is our largest heavy duty soft case. It is made of the same heavy duty construction as our other thickly padded travel cases. Outside dimensions are 39" X 10 1/2" X 101/2". Inside dimensions are 36" X 8" X 8". Has two internal dividers that are held in place by velcro and can be easily removed. The optional C130HC is quite a case! It is made of 3/8" plywood and finished with tough PVC laminate, metal edges, and steel corner reinforcing brackets. Features include two dolly wheels to help you move it around, a spring-loaded heavy-duty handle that is flush to the case, two turn-to-open draw latches, three metal hinges and webbing straps to keep the lid from falling backwards. The case interior is lined with foam, and a custom cutout is provided for your 130. Outside dimensions are 43" x 13" x 14" and the weight (without telescope) is 28.6 pounds.